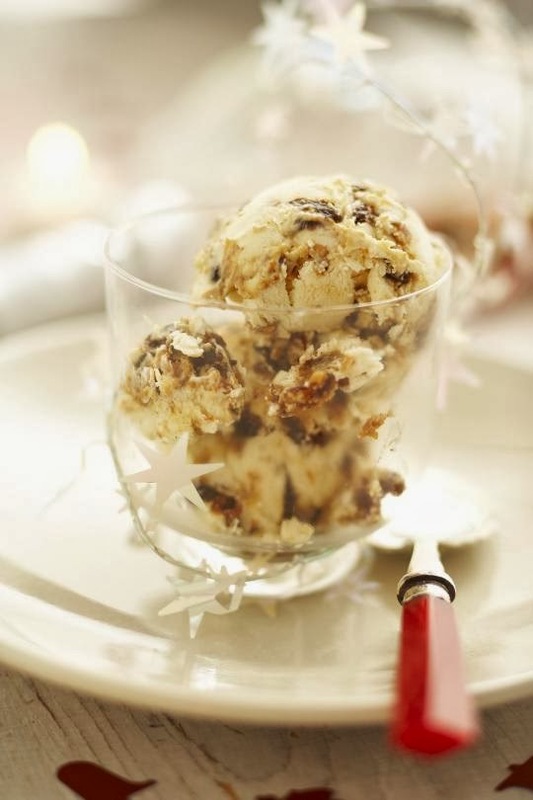 One of my most popular festive recipes is Christmas Pudding Ice Cream, and at this time of year I make several batches to store in the freezer. It is just as tasty as Christmas Pudding but is a lighter alternative, and kids of all ages seem to love it! 1. Bring the milk, cream, half of the sugar & the vanilla pod just to the boil, then remove from heat. 2. Whisk the egg yolks with other half of the sugar. 3. Add the egg mixture to the warm cream mixture and whisk. 4. Return to the heat & warm gently until mixture coats the back of a metal spoon - don't let it boil! 5. Remove the vanilla pod and chill until cold. 6. Crumble the Christmas pudding into the cold custard. 7. Stir in a good slug (3-5 tablespoons) of brandy. Tip 1: If you're short of time, instead of making your own custard you can use a 500ml tub of fresh ready-made custard, or a 500ml tub of fresh ready-made brandy or rum sauce. Tip 4: For a really quick and easy version, simply add crumbled pudding or cake to a 500ml tub of good quality vanilla ice cream, such as Haagen Dazs.